Earlier this year I discovered an abnormal bump on the inside of my left wrist. It was as tiny as a pebble, but it had me fearing the worst. (Maybe that’s why they say not to go Googling symptoms.) I picked up the phone and made an appointment to see my doctor, to get a professional opinion. I expected to walk out of his office that day with peace of mind, on my way to a full recovery, maybe enjoying a laugh on the way out the door. But when he told me that he wasn’t able to diagnose my problem and that I should go get an X-ray immediately, I didn’t find it too humorous. When the X-ray proved inconclusive, I really began to lose my mind. Next, I went to see an orthopedist who was also perplexed by the nature of my visit, but assured me that the fact that the bump moved from side to side was a good thing. I just thought it was gross. Now, I was on my way to get my first-ever MRI, (a truly memorable experience for someone as claustrophobic as me). When those results, too, proved inconclusive, I was presented with two options: take it or leave it. I opted for surgery and a few weeks later, I was laid up in a Washington Township surgical center before dawn on Valentine’s Day morning. When all was said and done, the surgery was shorter than my MRI (not to mention the nightmares I still have of those screeching metal monsters) and I am no worse for the wear. It was a nerve-wracking experience, but thanks to the skillful work of my orthopedist, I now know that the bump was a buildup of fiber tissues on my tendon. And, with the help of some Mederma, my scar is all but an afterthought. 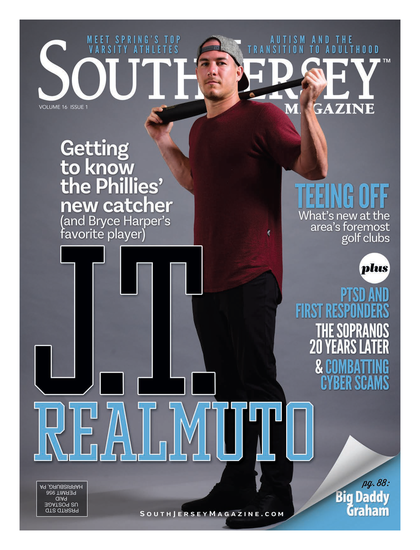 I was reminded of my situation when putting together this issue of South Jersey Magazine. Each year, this annual roundup of Top Physicians serves as the authoritative voice for our region. In these pages you’ll find a list compiled by Best Doctors, an independent evaluation service that polls the country’s physicians, as well as a list of our readers’ choices. Consider it one big referral—hundreds of doctors with varying specialties who keep us living happy and healthy lives. I was fortunate enough to get to know 12 of these wonderful physicians during a recent photo shoot, and you can find out more about them starting on Page 71. After getting acquainted and hearing their passion for the profession, I was pleased they were rightfully being recognized. For the record, my orthopedist made the list, too. It’s good to know that the special treatment I received goes for everybody.